Muttenz, March 23, 2015 – Clariant, a world leader in specialty chemicals, is a finalist in the prestigious German business innovation award, “Innovationspreis der Deutschen Wirtschaft 2015”, category Large Company. The achievement relates to Clariant’s Licocene® polyolefin-based waxes, recognized for advancing sustainability in textiles, plastics and coatings manufacturing and improving the environmental profile of a wide range of applications. Licocene waxes give manufacturers the possibility to use fewer ingredients, reduce manufacturing steps, and use less resource-intensive production processes. For example in textiles, close cooperation between Clariant and German coatings and laminate specialist LACOM GmbH, has succeeded in changing energy-intensive, water-based textile coating technology to a less energy-consuming process of hot melt coating using very low amounts of Licocene additives. There are also environmental benefits for final products, such as improving the recyclability of textiles, or reducing product weight. Licocene’s ability to support more sustainable processing is particularly valued in energy-intensive sectors, such as technical textiles for mattresses, furniture and carpets for automotive and aerospace interiors. They are also used in the manufacture of masterbatches and engineering plastics, as well as in industrial coatings, and in printing inks and adhesives for packaging applications. The award jury of leading science and business representatives also acknowledged Licocene for promoting home-grown R&D and technical processing within Germany. The product’s development involved collaboration between Clariant’s researchers in Höchst and researchers at the University of Hamburg, leading to the piloting and building of a full-scale production unit in Germany. Clariant continues to work closely with its customers both inside and outside of Germany to use Licocene to bring sustainability advances to the market segments. As of 2016, the company will have achieved a 50% increase in its production capacity for Licocene to support the increasing interest in the product and its extensive application possibilities. “This accolade for Clariant reinforces the increasing importance placed on sustainability within society today. With Licocene systems users can achieve significantly higher efficiency levels, supporting efforts to address current global challenges such as the efficient use of resources and energy,” comments Oliver Kinkel, Head of Business Unit Additives, Clariant. 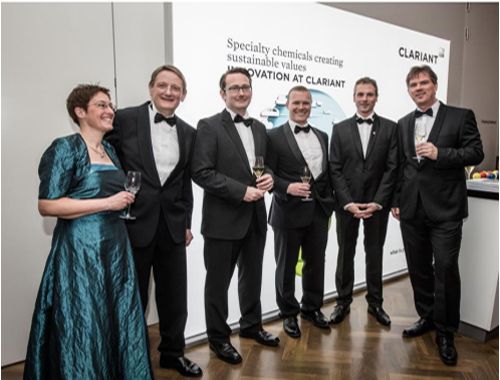 Clariant joins fellow finalists for the 2015 award ceremony and gala dinner on March 21, 2015 in Frankfurt am Main. This is the second occasion a Clariant development has been acclaimed by the organizers. The company’s Exolit® halogen-free flame retardants were in the final of the “Innovationspreis der Deutschen Wirtschaft 2012/2013”.